You May Soon Be Drinking Cannabis-infused "Coca-cola"
Numerous debates have taken place in recent years around the question of the legality of cannabis between supporters of the idea and its detractors. Several studies have demonstrated the different medicinal virtues of this plant very often seen as a simple drug. Moreover, an article published in the newspaper Le Figaro, informs that the company "Coca Cola" is in talks with the Canadian group "Aurora Cannabis", in order to market a drink infused with cannabis. In May 1886, in Atlanta, Georgia. Pharmacist John Pemberton began selling the very first bottles of the new medicinal drink he had invented in order to get rid of his addiction to morphine. He had first marketed it as a tonic beverage for the brain and nerves, and gave it the name of "Coca-Cola" because of its two main ingredients, namely caffeine derived from kola nuts and cocaine. . Unfortunately, his drink did not have the desired effect at all. Two years later, he decided to sell the rights of his formula knowing that the purchasing company submitted to public opinion by reducing the rate of cocaine in the drink in the year 1929. But today, having been seen as a global symbol of obesity for 130 years, the world's largest soft drink company would be tempted to go back to basics, but with a completely different method. The company "Coca-Cola" would indeed be in serious talks with "Aurora Cannabis Inc.", in order to produce cannabis-infused drinks. Since Canada legalized Cannabis for recreational purposes (personal use), many local companies have entered new markets that are directly related to this plant by incorporating it into food such as brownies. protein bars or in drinks, as is the case for cannabis beer. A new field of activity that represents a real boon for multinationals who have been facing a stagnation of sales in recent years, moreover, Coca-Cola is not the only company interested, since there is also other companies producing alcoholic beverages that follow the case very closely. The famous multinational would first start the conquest of this new market in the UK and focus on the medicinal benefits of cannabidiol (CBD) which is a component of cannabis that can relieve some pain and inflammation, but has no psychoactive effect. A partnership between "Coca-Cola" and the Canadian Alberta company "Aurora Cannabis" would be a news of great importance, since such an agreement would mean that it will be the first major producer of non-alcoholic beverages to introduce the cannabis market. Negotiations are nevertheless kept secret since, according to the spokesman for "Aurora Cannabis", the company does not usually comment on projects under development. Their intention to enter the infusion market is however obvious. It would even seem that the Canadian producer does not have only "Coca-Cola" as sole potential partner for this type of product, which makes it likely that these negotiations will not succeed. In an official statement, the Coca-Cola company said: "Alongside other beverage producers, we are all watching the growth of the non-psychoactive CBD market as it has the potential to become popular. around the world ... Things are changing fast but no decision has been made yet. " 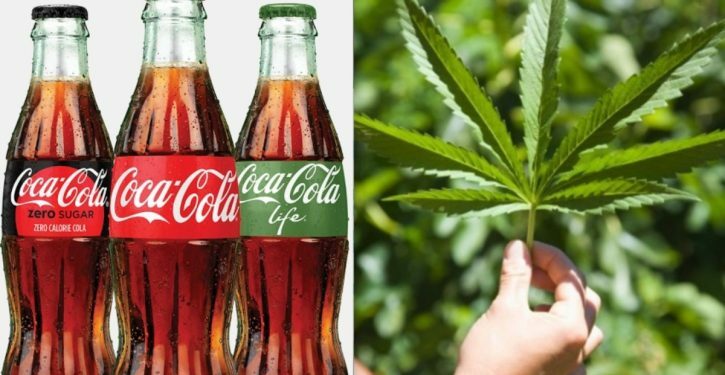 Savvy Life Mag Plus: You May Soon Be Drinking Cannabis-infused "Coca-cola"